Data drives much of what we do at IWCO Direct to power our clients’ marketing. Data informs every element from the offer we send, to whom it’s sent, through which channel, and when. That’s because data now drives much of the consumer experience. Think about all the data you use in your daily life. Maybe you use a health app to track your exercise, sleep, or eating habits. Maybe you use a mobile banking app to stay on top of your finances, or social media to keep in touch with friends and family. Each of those is powered by data and each will provide a different experience based on your goals, habits, and interest. Data has become an integrated part of consumers’ lives—including what they purchase, how they purchase, how they use the product, and how they interact with a brand—so why shouldn’t marketing be data-driven as well? Companies who use data-driven marketing are making a sound investment of their marketing dollars because data directs and refines marketing efforts at every step of the way and makes omnichannel marketing efficient and effective. Your organization likely has an existing marketing strategy, which may utilize a traditional mix of radio, TV, or out-of-home advertising (like billboards, transit ads, and posters). Like technology, marketing strategies have also advanced rapidly in recent years, so it is prudent for all organizations to periodically evaluate efforts and make sure they’re spending wisely on a program that will provide return on marketing investment (ROMI) and new customers. An organization’s most powerful marketing tool lies in identifying and creating an accurate model of their current customers. In order to drive ROMI, it’s crucial to target prospective customers with the strongest need for your service. Accurately identifying and modeling current customers is a significant part of identifying your most valuable target market. For most organizations, that means finding a reliable marketing partner with the tools and expertise to help you identify these prospective customers. While budget-conscious marketers may hesitate to invest in such services, limiting your scope to the most likely prospects while excluding others is vital to spending your marketing dollars in the most effective and efficient way possible. (You don’t want to market dog toys to a cat lover or steaks to a vegetarian.) The algorithms and modeling capabilities provided by a marketing partner are worth every dollar when responses come in. Equally as important as finding the right target market is capturing their attention. Unfortunately, attention is hard to gain and even harder to keep these days, with the average American seeing anywhere from 4,000 to 10,000 ads every day, according to Red Crow Marketing. With a variety of consumers on multiple platforms, it’s essential to have an omnichannel direct marketing strategy in place in order to reach your prospective customers. The creation of an omnichannel, data-driven marketing strategy—with rotating advertisements on social and digital platforms, as well as direct marketing via email and physical mail—can drive awareness and create demand. Using consumer behavior data, we can create a delicate balance of content and channel to introduce a company and service in a way that feels organic. This type of marketing plan approaches a prospect in a way that builds upon itself and is not overly obtrusive. For example, a social media ad might spark the interest of prospects while they’re browsing their feeds. A mailpiece arriving a few days later would provide a tangible link to the service offering and position the brand as a trustworthy source. A follow-up digital communication would then serve as a great reminder of the services and provide a quick and easy-to-use call to action. Better yet, the previous interactions would lend familiarity to the brand, giving the email a greater impact. 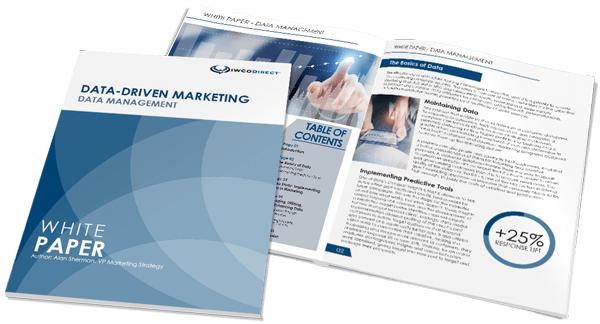 These data-driven marketing solutions might appear to be simple strategies, but they need to be implemented correctly to achieve success. For businesses that need to maximize their budgets, the guidance of a marketing expert to sift through data and direct an omnichannel campaign is well worth the investment. Targeting the right prospective customers and developing an efficient omnichannel strategy can help businesses continue to make great strides in customer acquisition and satisfaction. To maximize the impact of your marketing efforts, make sure to work with an experienced team that has the tools and expertise to develop a cost-effective, sophisticated omnichannel campaign. Need help getting started? Our marketing and creative services teams are happy to help.